When you're finally celebrating being out of the workforce and are living life to the fullest, humorous retirement stories seem to almost happen on their own. Spending more time with grandchildren, getting out, meeting other people and even traveling can provide subject matter for humorous stories about retirement that will keep you and those around you holding your sides in laughter. Funny doesn't even begin to describe some of the crazy situations you may find yourself in. There are many different things that can happen that create cause for laughter. Laughing at yourself is perhaps one of the best character traits a person can have. 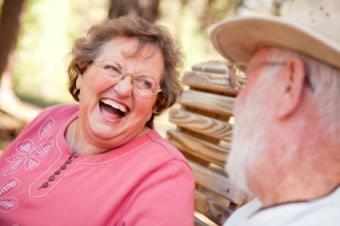 Get others laughing with you and you're certain to remember these humorous retirement stories for years to come. Trying New Things: Many people wait until retirement to try new things they've been dreaming about for years. Whether you go parasailing in the Caribbean or take an RV into Alaska, you're certain to run into troubles somewhere along the way any time you get out in the world and try something different. Relating these situations to your friends and family and being able to look back on the eighteen flat tires from the rocky Alaskan roads adds a lot of humor to your life. Spending Time with Grandchildren: Spend fifteen minutes with a child and you'll discover that they are downright funny. Small children say cute things, say words the wrong way and point out details in the world that you might not otherwise have noticed. Sometimes children are just downright goofy, forcing a grandfather to dress up in a pretty hat for a tea party. Consider jotting down any funny moments in a journal so you can remember them later. Joining Clubs: With retirement comes more time to join clubs and groups. Anytime you put yourself in the company of other people, at least one funny thing is guaranteed to happen at some point. Maybe it is that a prim and proper friend puts her dress on inside out and wears it around all day before noticing. Or, maybe it is that you've mispronounced the speaker's name into something funny. For example, a name like Micky Monk might be misconstrued as Monkey Monkey. Just Plain Fun: More time to hang out with friends is just plain fun. There will be many moments for laughter, humorous memories and thinking about even more interesting things to do. Go to comedy clubs, see the latest movies and attend dinner theater for even more experiences. Should You Retell the Humorous Story? Will the retelling hurt anyone or hurt their feelings? Am I just poking good natured fun at myself instead of others? Is the story so embarrassing that I might never live it down? Has something similar already happened to someone else in my friendship circle? Have I told this story to this group before? You'll also find a nice collection of our Top 10 choices in funny retirement joke sites.